For AR a certain range of data (images, animations, videos, 3D models) may be used and people will see the result in both natural and synthetic light. Also, users are aware of being in the real world which is advanced by computer vision, unlike in VR. Processing: AR devices eventually should act like little computers, something modern smartphones already do. In the same manner, they require a CPU, a GPU, flash memory, RAM, Bluetooth/WiFi, a GPS, etc. to be able to measure speed, angle, direction, orientation in space, and so on. Reflection: Some AR devices have mirrors to assist human eyes to view virtual images. Some have an “array of small curved mirrors” and some have a double-sided mirror to reflect light to a camera and to a user’s eye. The goal of such reflection paths is to perform a proper image alignment. Marker-based AR: Some also call it image recognition, as it requires a special visual object and a camera to scan it. It may be anything, from a printed QR code to special signs. The AR device also calculates the position and orientation of a marker to position the content, in some cases. Thus, a marker initiates digital animations for users to view, and so images in a magazine may turn into 3D models. Markerless AR: location-based, or position-based augmented reality, that utilizes a GPS, a compass, a gyroscope and an accelerometer to provide data based on user’s location. This data then determines what AR content you find or get in a certain area. With availability of smartphones this type of AR typically produces maps and directions, nearby businesses info. Applications include events and information, business ads pop-ups, navigation support. Projection-based AR: Projecting synthetic light to physical surfaces, and in some cases allows to interact with it. These are the holograms we have all seen in sci-fi movies like Star Wars. It detects user interaction with a projection by its alterations. Superimposition-based AR: Replaces the original view with an augmented, fully or partially. 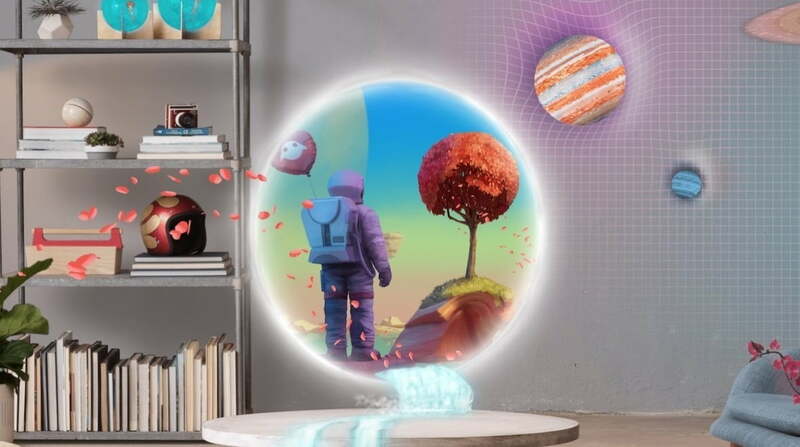 Object recognition plays a key role, without it the whole concept is simply impossible..
Augmented reality gaming (AR gaming) is the integration of game visual and audio content with the user’s environment in real time. AR games are typically played on devices like smartphones, tablets and portable gaming systems. The most popular is undoubtedly Pokemon Go, developed by Niantic, which uses uses a smartphone’s camera, gyroscope, clock and GPS and to enable a location-based augmented reality environment. Other popular games include Bee Ready, Domino World, Ingress etc. The US Army in 2003 integrated the SmartCam3D into the Shadow Unmanned Aerial System to aid sensor operators using telescopic cameras to locate people or points of interest. Combining fixed geographic information including street names, points of interest, airports and railroads with live feed form the camera. The use of augmented reality will transform the music industry with new methods used for music production, mixing, control and visualization. A 3D music creation tool allows them to to play dozens of sound samples placed anywhere in 3D space. AR now also allows users to learn music from the comfort of their home through a ARmony software package. ControllAR project allows musicians to augment their MIDI control surfaces with the remixed graphical user interfaces of music software. The Rouages project proposes to augment digital musical instruments in order to reveal their mechanisms to the audience and thus improve the perceived liveness. Where else could you use AR best but in Architecture to correctly visualise buildings, their layouts and blueprints. Computer-generated images of a structure can be superimposed into a real life local view of a property before the physical building is constructed there. Architecture sight-seeing can be enhanced with AR applications allowing users viewing a building’s exterior to virtually see through its walls, viewing its interior objects and layout. Many of us find that we learn more efficiently when we see things visually and so, augmented reality is encouraging this form of learning. The whole experience of finding out what is around you can be improved through the use of AR. A world where you can find reviews of restaurants, the best deals and even information about buildings or bus routes in the area you are in can change the way in which you think and the technology is as good as available. This is urban exploration on a technological level but it can open your mind to information on demand, where almost anything is accessible. These days, when we want to buy something, the majority of us begin our search online. This removes our ability to try things out before we purchase but AR is making that possible again. Imagine being able to find out whether a piece of furniture fits before you purchase it by trying it out using augmented reality technology. Large businesses such as IKEA and Target are putting customers in control of what they purchase by making this a possibility for them and that is altering the purchasing power of individuals.